“Oh! I love mess!” That is possibly something you will not hear on a daily basis – even from someone whose living space is literally a junkyard – but that’s Marie Kondo for you! One of the celebrated organizing consultants and author, Marie Kondo’s philosophy lies in treating the home as a sacred space and keeping it organized to keep our minds free of all woes. A professional organizer, Marie Kondo’s theory of keeping the house de-cluttered and organized is based on the Japanese art of organizing or KonMari method. But what is exactly this KonMari method? The newest Netflix sensation – ‘Tidying up with Marie Kondo’ – talks about just that and in great detail. A one-of-a-kind TV series, Marie Kondo’s show portrays the essentiality of having a mess-free house – not only to help us be more productive but to help us achieve a sense of calmness and relaxation, which we never thought we were lacking. Living A Minimalist Life – But Not Quite! The basic essence of Marie Kondo’s theory entails the idea of minimalism, which the Japanese have been practising since ages immemorial. However, in today’s time and world, it is not always possible to lead a minimalistic life, especially for someone who loves to shop, decorate the house and have a comfortable life. Marie Kondo’s ideas are of great help here. To start with, she helps us understand that minimalism does not have to be a synonym of penance. It simply means one can have everything he or she desires, but should not have something in excess or hoard things which one may not find pleasure in anymore. For example, a person can be fond of books or clothes – and he or she may be a hoarder of the same. But somewhere down the years, the old ones may seem like bad buys or the requirement may just be over. In such cases, we seldom junk the same away – we either forget about it or tug it in somewhere below the new ones. 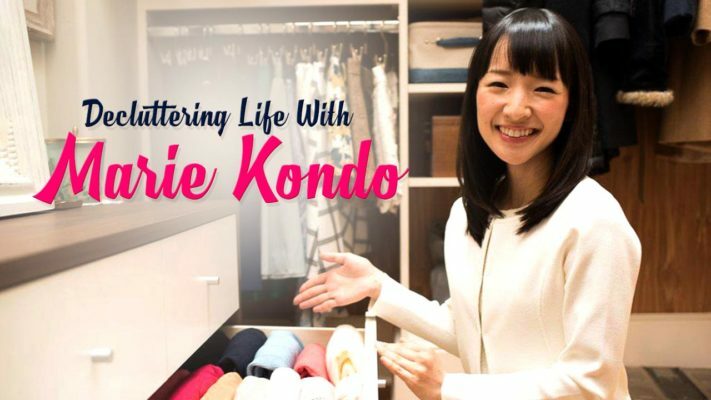 The series, ‘Tidying Up With Marie Kondo’ that aired its first season on Netflix, shows Kondo accumulating every piece of clothing or book or utensils (in separate units, of course) and decides whether one needs every single piece at all. Her theory is pretty simple when it comes to de-cluttering: the more you discard things, the easier it becomes to tidying things up. One of the most profound things that I found in the series is how Kondo goes through the entire process of organization – she sees it not as a chore but as a spiritual purification process. At the beginning of each episode, she brings in all the members of the house together to sit back and thank the house for being there and protecting them against all odds. Thereafter, she goes about the cleaning process by hoarding everything in a place, then holding each item in the possessor’s hands to feel and decide if that item “sparks joy” in him/her. If it does, the thing has to be kept. If it does not, the thing should be discarded. According to Kondo, tidying is more of a “special event” than a regular, boring chore. The best thing that Marie Kondo introduces is that one should clean up everything not by location but by categories. In her five-step organizing technique, she distinguishes the categories like apparel, books, kitchen, komono (miscellaneous items) and sentimental items. That special values should be given to personal belongings that have an amount of sentiment attached to it indeed talks a lot about the idea behind minimalism altogether. Aside from all the theories that Marie Kondo’s TV show promulgates, one of the most important things which many might miss out on is the fact that a cluttered house not only stalls our productivity but clogs our brains to the extent that we tend to even mess up our relationships with our loved ones. The first episode of the series takes us to a young American household, which looks so much replenished with love, laughter and happiness. However, a bit into the episode and one finds that the couple – in maintaining their roles as professionals and parents – somehow lose out on their relationship. A big reason is a mess that their house it – the house though big is so cluttered and messy that it clogs up their minds and does not let them think beyond the physical – beyond what they see. It does not give them the opportunity to think openly and freely. However, once the house is all clutter-free, airy and peaceful, one can sense their relationship getting all lovey-dovey once again. After all, they don’t have to ponder much about the chores getting done or getting things out from the mess to use. While one may say that this part is scripted, the aura of the well-done home is so strong that it even rejuvenates the minds of the audiences as well – watching Marie Kondo’s TV series is therapeutic and there is no denying it. It is like embarking on a spiritual journey itself and de-cluttering the mind just by watching the series. The way Marie Kondo’s Konmari method urges you to establish a spiritual relationship with your house is something that global readers and audiences have not really come across. It is also undeniable that ‘Tidying up with Marie Kondo’ comes across as a series that not just adults, but even children must watch – after all, the method brings families together and sparks joy in the hearts of everyone.